In this July 26, 2018 photo, American jazz trumpeter Roy Hargrove performs at the Five Continents Jazz festival, in Marseille, southern France. The Grammy-winning jazz trumpeter has died at age 49. Manager Larry Clothier says in a statement that Hargrove died in New York on Friday from cardiac arrest stemming from a longtime fight with kidney disease. 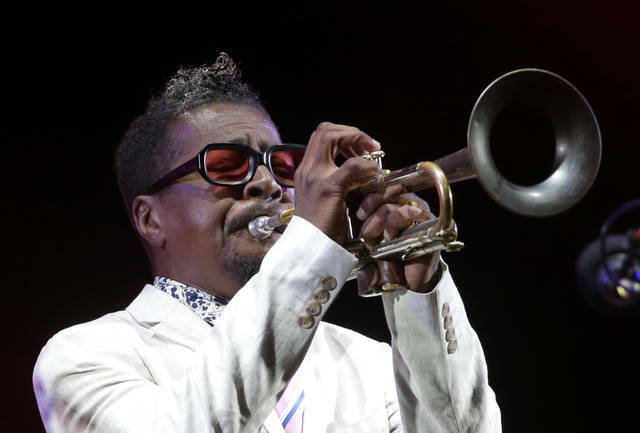 LOS ANGELES (AP) — Trumpeter Roy Hargrove, a prolific player who provided his jazz sound to records across a vast range of styles and won two Grammys, has died at age 49, his manager said Saturday. Hargrove died in New York on Friday of cardiac arrest stemming from a longtime fight with kidney disease, longtime manager Larry Clothier said in a statement. Hargrove released his first solo album, “Diamond in the Rough,” in 1990. He won his first Grammy in 1998 with his Afro-Cuban band Crisol for its album “Habana.” He then won another in 2002 for “Directions in Music Live at Massey Hall,” featuring a band he led with pianist Herbie Hancock and saxophonist Michael Brecker.